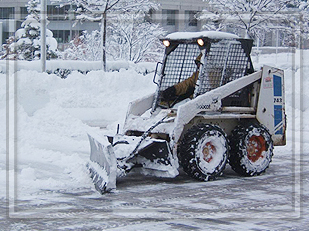 Intended to keep your clamoring commercial property free of snow and ice all through the whole winter, Calgary Greencrete provides Calgary's most reliable commercial snow removal services. Our flat-rate commercial contracts include the full maintenance required to ensure safe, unimpeded access to your premises, all winter long. We are prepared and experienced to take care of even the most demanding commercial properties, such as retail plazas and malls, office and professional buildings, industrial facilities, shipping and receiving hubs, and educational and religious institutions. Depending on the individual circumstances of the job, we have a variety of equipment at our disposal including graders, bobcats, plows, hauling trucks, commercial machine sweepers and sanders to meet your snow removal needs.